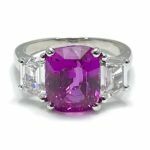 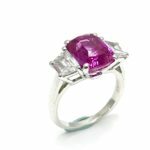 An absolutely stunning Oscar Heyman 6.32 carat Pink Sapphire and trapezoid cut Diamond platinum ring. 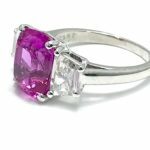 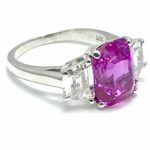 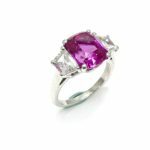 The Pink Sapphire displays breathtaking color, set in a four prong basket setting with two trapezoid cut Diamonds on either side. 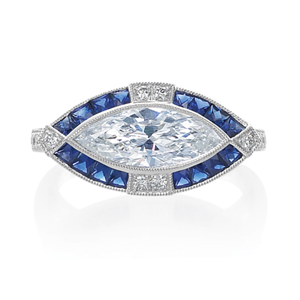 The Diamonds have a total weight of 1.04 carats, and are graded as F color, VS2 clarity. 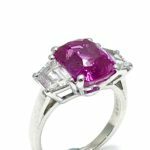 The Sapphire has been graded by the American Gemological Laboratory, stating that it is Natural Corundum, with an origin of Madagascar, and Excellent Color Stability. 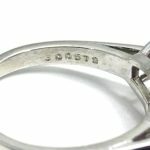 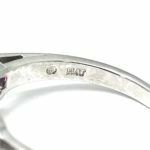 The ring is hallmarked “Plat” and serialized “300572”. 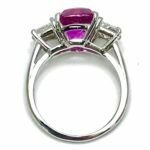 It is currently a size 6.25, and could easily be adjusted.